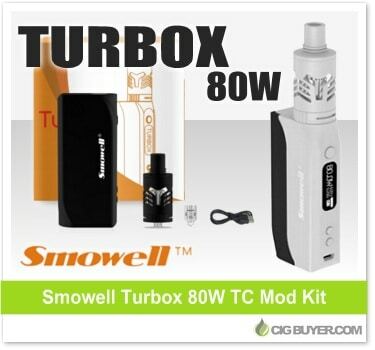 Here’s a great looking device that incorporates new ceramic coil technology – the Smowell Turbox 80W Mod Kit. Powered by a single 18650 battery, the Turbox Mod offers up to 80W of output with temperature control; firing as low as 0.05 ohms. It comes with the 4ml Smowell Divergent Tank, featuring a 0.5 ohm SS coil for temperature control and a 0.5 ohm ceramic coil that offers all the benefits of ceramic. The setup includes adjustable airflow, magnetic battery cover, USB charging, spring-loaded 510 and heat dissipation holes on bottom.